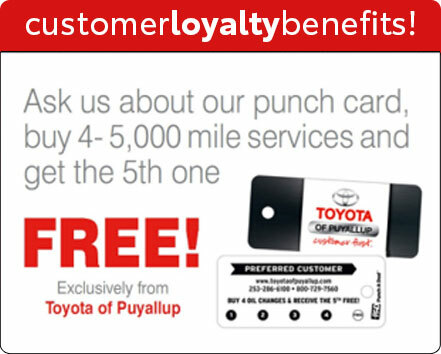 Toyota of Puyallup offers money-saving service specials and parts discounts in Puyallup, Washington. 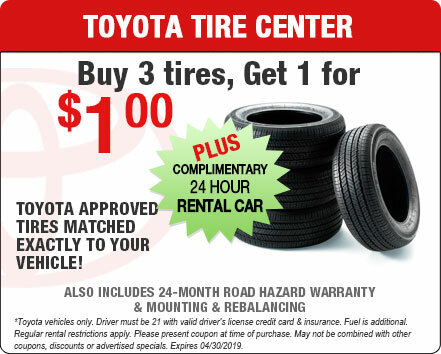 Our local Toyota dealer is a full-service car dealer. In addition to our full selection of new and used cars for sale, we also offer a state-of-the-art service department and a fully-stocked parts department. 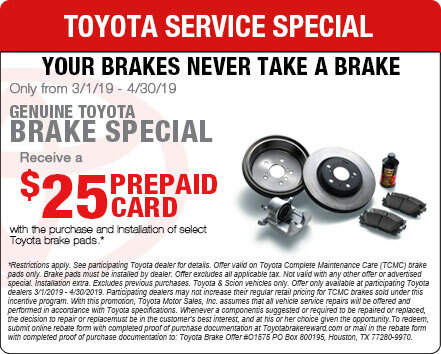 The next time you need an affordable oil change or a quick brake job, browse our current dealer specials and promotions. 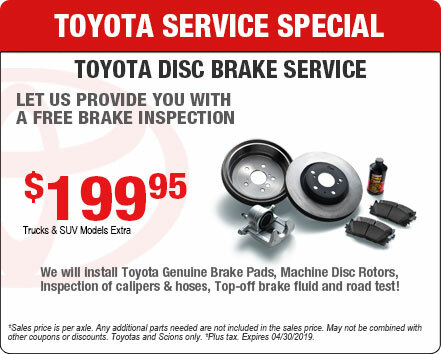 Our menu of service specials changes regularly. 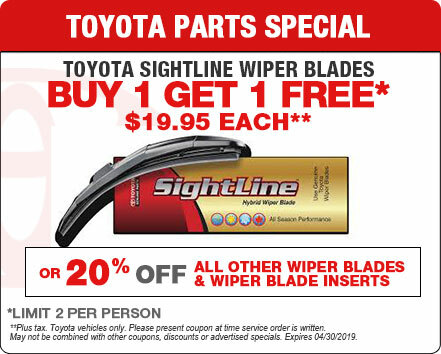 Be sure to check back often, so you never miss a money-saving deal on auto repair. 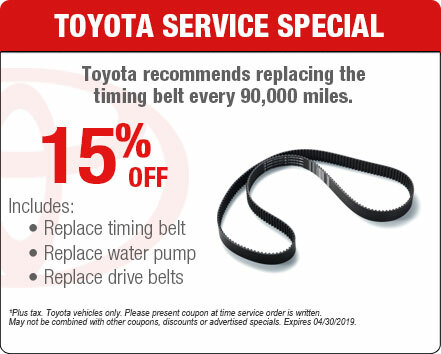 When you schedule your auto repair, be sure to ask our team about our current service specials. Routine auto maintenance leads to improved engine performance and fuel economy. Don't risk the health of your vehicle or the safety of your passengers because you think car maintenance is too expensive. We offer auto repair discounts to help you maintain your vehicle. 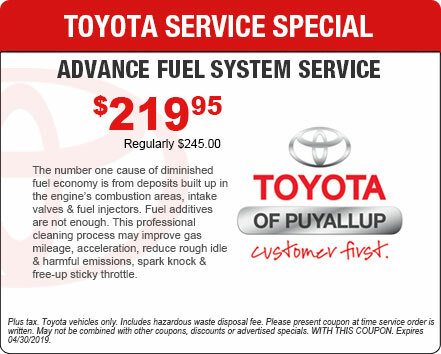 If your used Tacoma truck is due for its next oil change, browse our service specials for synthetic motor oil coupons. 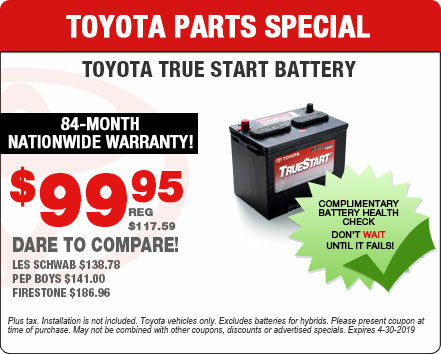 When you need a quick oil change, tire rotation, car battery test, or brake inspection, come to Toyota of Puyallup. Take these easy directions to our Toyota dealer Tacoma and Seattle.